After defeating Vanderbilt in a slow-paced Saturday night showcase at Rupp Arena, Kentucky is back on the road in Athens to take on — wait for it — Tom Crean and the Georgia Bulldogs. All seriousness aside, it’s good to have Tom Crean’s face back in the BBN. He went away for far too long before resurfacing in SEC country. His stupid facial expressions have been missed. Here’s to hoping plenty of them accompany an exceptional Kentucky performance at Stegeman Coliseum. Crean’s first Georgia team is 9-6, 1-2 in SEC play with losses of 46 points to Tennessee and 15 last Saturday at Auburn. Like Kentucky’s last two opponents, this game is less about the opponent and more about the team. If the Cats play their game with a sense of urgency, they should cruise. If not, it could be another ugly, knock down, drag ’em out. Karl Ravech, Jimmy Dykes and Laura Rutledge will be on the call for ESPN beginning at 7:00 pm. If you’re stuck on the road and can’t watch, there are multiple ways to listen to The Voice of the Wildcats. The Cats opened as 6-point favorites over Georgia. You’ll currently find the line at UK -7. For those who prefer over/unders, that line has been set at 147. Wager responsibly. Before the Cats take the court, listen to Matt Jones and the KSR crew preview the matchup between the UK and Georgia. All of the action begins on 630 WLAP or online at 4:30 pm. Athens-Ben Epps Airport isn’t exactly a buzzing metropolitan air facility. Most people typically fly to Atlanta and make the drive, but the Kentucky basketball team isn’t most people. 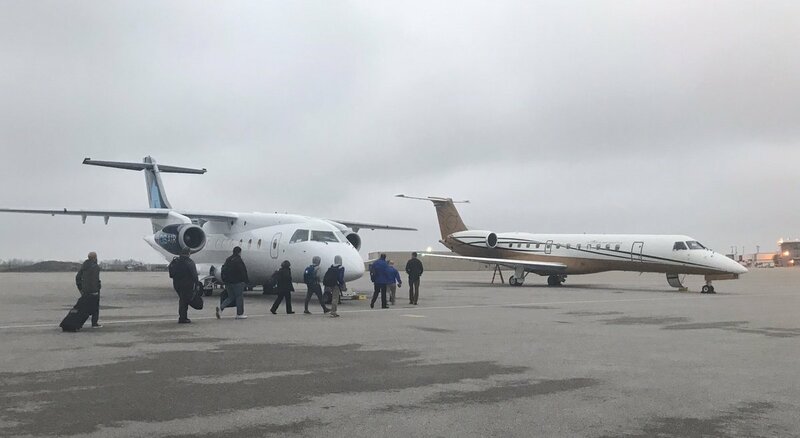 The players took one small plane. The staff took a second plane, one that beat the players to the runway. Ashton Hagans will enter his home state on fire. A Cartersville, Georgia native, Hagans initially committed to play for the Bulldogs. When Mark Fox was fired, Hagans reopened his recruitment and eventually found a new home in Lexington. I doubt Georgia fans forgot. Can Ashton keep it together? Reid Travis has not seen anything different this week from the point guard who’s been the Cats’ best player over the last five games. Hagans is not alone. E.J. Montgomery played high school ball just down the road in Marietta, Georgia at Wheeler High School. Will the Slow Starts End? Slow starts are starting to become a theme for this Kentucky basketball team. Saturday against Vanderbilt they trailed 16-4 five minutes into the game. Four days prior the Cats had to dig out of a 10-0 hole vs. Texas A&M. Both of those games were at home. Mounting a comeback is not as easy on the road, where the Cats will play their next two games. Few things are more captivating than a building implosion. Fortunately, a MARTA bus didn’t get in the way this time.